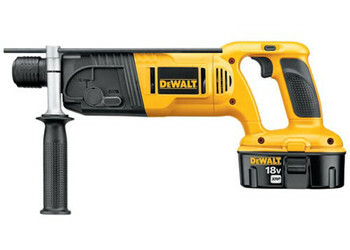 Dewalt Heavy-Duty 7/8 in. (24mm) 18V Cordless SDS Rotary Hammer Kit. Variable speed, reversing switch delivers versatility in all applications. Factory-set clutch reduces sudden, high torque reactions if bit jams. Electro-pneumatic hammer mechanism for fast penetration and low vibration. 360° side handle for better control and ease of use in tight spaces.